In August 2013, Gartner publised an interesting article "When Will Your SAP Basis Operations Team Get the Automation Tools That They Need?" The answer should be yesterday, but about 5 years later, SAP Basis teams are still asking the same questions. Users and Business teams are getting better applications, Functional and Development teams are getting better tools, so don't Basis teams deserve better operations solutions? What's Up with SAP HANA Multi-tenancy? On June 23, 2015, I attended the SAP HANA Operations Summit at SAP Labs in Palo Alto and there was a lot of buzz around Multi-tenant Database Container (MDC) or Multi-tenancy. Recently, we also encountered some of our SAP monitoring customers who deployed MDC, so this publication will summarize some of the highlights and findings encountered with MDC. 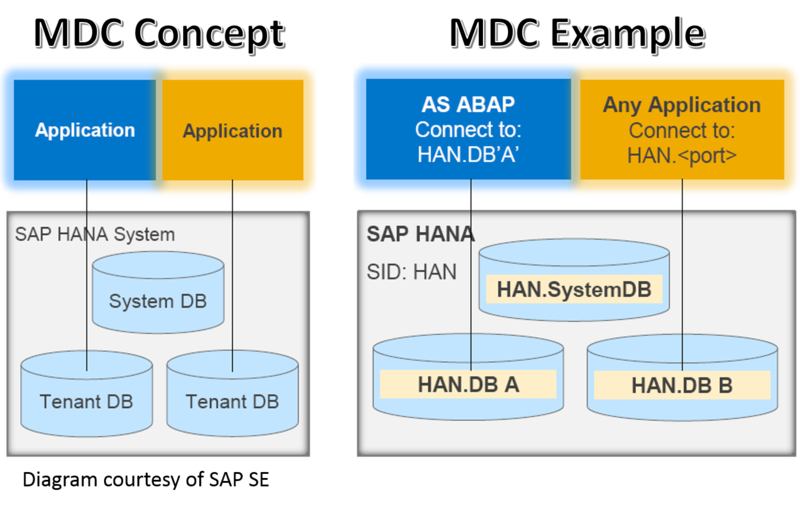 There is a good summary of what Multitenancy and how to convert HANA to a multi-tenant system, so I won't restate them here, but if you have ever worked on a SAP MCOD (Multiple Component on One Database) system, it is similar. MDC is available as of SPS09 revision, either as new install or converted from a single database system.